Main functions: skin cleaning, blackhead absorption, pulling tight, moisturizing and shrinking pores. The Aqua Plus- small bubble instrument is a device for making us pupil based on the principle of fluid mechanics. Spraying the beauty solution by the specially made elliptical head spiral movement, and quickly absorbing the dead skin on the skin surface and the dirt in the pores. AHA, BHA, VITAMIN-C components of the beauty solution can effectively go to the dead skin, black / white head, calm the skin promote the regeneration of the skin, and complete the 3 stage full effect care. Handle function: water suction, radio frequency, freezing, ultrasonic wave. Compared with conventional laser treatment, there is no pan redness symptom after using Aqua Plus instrument. 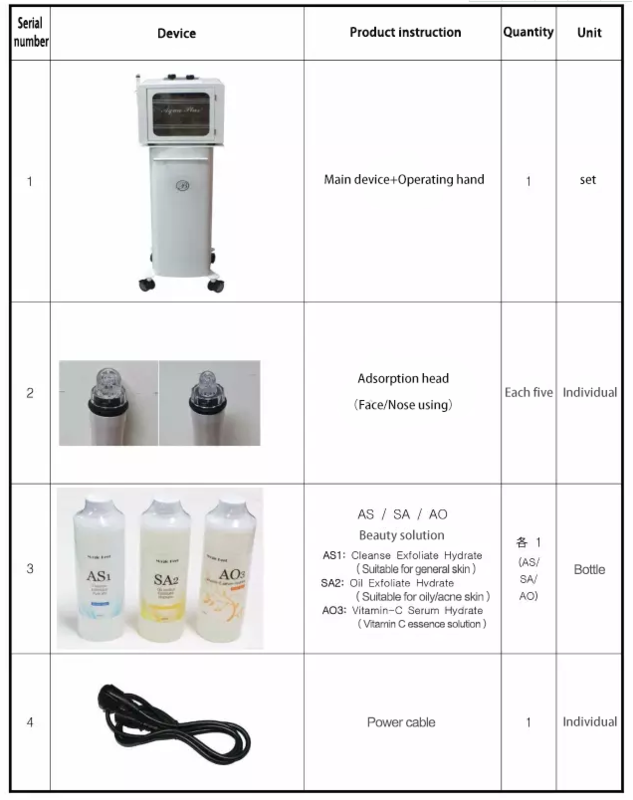 Vacuum adsorption and injected into the skin with AHA, BHA, VITAMIN-C morning beauty solution, can effectively remove the dirt in the skin, hair follicles, horniness and sebum. Simple method of operation after you receive skin care, nursing return to daily life, no inflammation, pain and side effects. Non-irritating and painless skin management. When vacuum adsorption is continued, water is injected into the skin continuously to achieve the effect of nursing and water supply. The adsorption head and hand-held bar are easy to disassemble, which is conducive to health management. Aqua Plus is a special solution in three stages to effectively help the sebum, blackhead and aging of the pores, while reducing the skin on the skin by sebum and aging of the hair follicle, improving skin texture, whitening and improving acne skin management instruments. 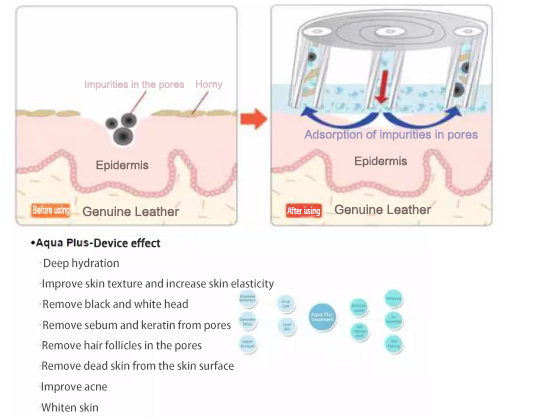 vacuum negative pressure technology combined with specific solution has low irritation effect, S1 solution softens cuticle, and low irritation and cleanliness. S2 solution to black head white hair, acne, improve hair follicle. S3 solution shrink pores, replenish water and nutrition, effectively help regeneration, brighten skin color and make skin full of luster.